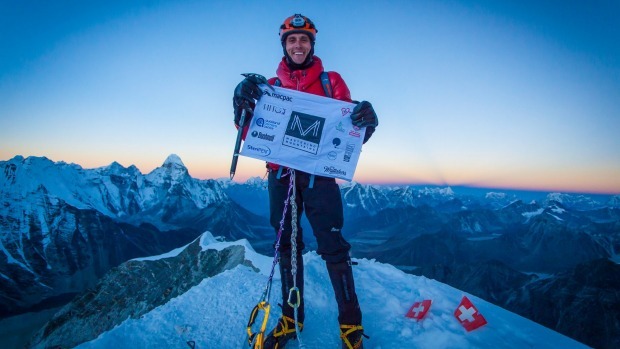 Nicholas Allen recently scales Island Peak, in Nepal, to raise awareness for Multiple Sclerosis. He found out not long ago that he was a sufferer. Twice the height of Mt Cook, a Palmerston North man has realised his childhood dream climbing up Nepal's Island Peak. At over 6,000 metres, Nick Allen ascended the mountain with more than just the peak in mind, as he hopes to continue to raise awareness of multiple sclerosis. Allen was diagnosed with the auto-immune disorder five years ago and his childhood mountain-climbing dreams were seemingly dashed as fatigue, bladder and balance problems. "When I got diagnosed, I though this is just a death sentence... I may as well give up. I'm not going to live a fulfilling life. "It doesn't need to be that way." He said stress and bad health were restricting him, but about a year ago, he decided to pursue his childhood dream after being made an offer he couldn't refuse: climbing in the Himalayas. Allen began cutting out processed foods, dairy, sugar and fat, and began exercising where he could. Mobility chair-bound, he built up to short walks, then longer walks, easy tramps and even climbing the 2700m-high Mt Ruapehu. After those months of training, Allen found himself negotiating his way across a pass with 800 metre and 200 metre drops on either side, as well ascending up 200 metre vertical rock faces. He reached Island Peak, at 6,160m, but he was not finished. With his guide, Allen continued through on a trek to Mt Everest base camp and to Kala Patthar peak, at which point he had to turn back because of a chest infection. The main message that Allen is trying to send to his New Zealand counterparts is that they can also push their own limits, no matter what their abilities might be. He felt fortunate that they disease had not progressed as fast as it might have for others, but believed people could do it. Whether that meant someone in a wheel chair was taken by helicopter through the Southern Alps, or someone received some support in doing a similar trek, he hoped to be able to get them there. Following discussions with Multiple Sclerosis New Zealand, an official scholarship is going to be set up to help others with the disease to be able to go on similar adventures, tailored to their abilities. 18 months ago the idea began "percolating" in his head, he said. Since he started fund raising, he has raised about $3000 for the foundation, but hopes to raise more through his website and climbs in the future. His intention was to bring other people suffering from the auto-immune disorder with him. Much like the "travel bug", Allen has found himself yearning to climb another mountain, he said. "I'm thinking about maybe doing Mt Cook next year, for sure." He also hopes to head back to Nepal to conquer the 6,812m "Matterhorn of the Himalayas", Ama Dablam. Meanwhile, Allen is organising charity dinners in both Palmerston North and Wellington in the coming months.